With dental implants, a missing tooth doesn’t have to mean a gap in your smile. 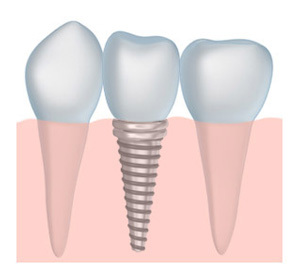 A dental implant is a synthetic tooth root created using a special titanium alloy that can fuse directly to your bone in a process referred to as “osseointegration.” By placing this tooth root in a gap left by a missing tooth, we can create a foundation for a beautiful dental crown, and a perfect tooth replacement. Dental implants are the only restorative option for patients who are missing teeth that will replace both the tooth root and the tooth crown. Each implant is made specifically for each patient to achieve optimal fit and comfort. A dental implant can replace a missing tooth without causing any problems with any adjacent teeth. Dental implants can restore your mouth’s full functionality. A dental implant can be used to replace a missing tooth. Dental implants can also be used to secure dentures or bridges. Each implant looks beautiful and completely natural. No one will be able to tell that you ever lost a tooth. Our implants are durable and long lasting. With proper care, an implant can last a lifetime. When you lose a tooth, your jawbone underneath the gap can start to deteriorate. A dental implant is the only restorative method for missing teeth that provides jaw bone support and helps decrease and prevent bone loss and deterioration. An implant dentistry procedure is typically performed over a series of appointments. During your first visits, we will begin by performing dental x-rays, and create impressions of your natural teeth. We will use these impressions to create your perfect implant. After careful planning and preparation, we will place your implant, and give your mouth plenty of time to heal. As soon as your mouth has healed, we will attach the abutment and the dental crown. To find out more about dental implants, call us at our office today.